It's snooker season here in Sheffield, so it's always good to have something quick and easy to do. As I'm in the mood for knitting, I started this jumper. 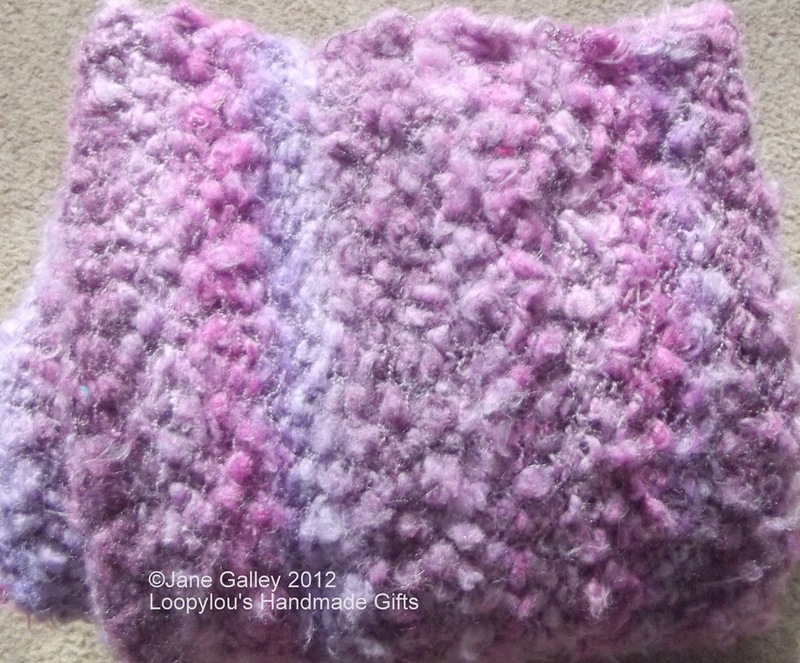 It's chunky yarn, knitted on even chunkier needles, so grows even quicker than my son! One session and I have a front. 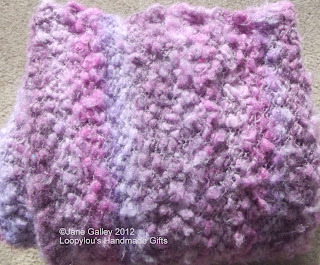 Unfortunately, sleepless nights caught up with me yesterday, and I slept instead of knitting. All being well, it should be close to finishing by the time the Championship is finished next week. This was a design in one of the Cross Stitch Gold magazines I wanted to clear out, but now, unknown to Daniel, he can have four owls, although, I'm not sure he will be as delighted as I am. Fotunately, he has a great sense of humour, so he will see the funny side. As I can only do this while he's out, I'm not expecting them to hatch quickly, but the first eye has appeared. He's away for a few days next week, so hopefully, good progress will then be made. Daniel has now moved on to pigs, so guess what I'm looking for now! In the meantime, I needed something that I could do in the odd few minutes that I had available, and to do while waiting for Daniel at various activities. While moving furniture and cleaning last week, I found a neglected project which is just perfect for those times. It's just a crochet square that will just grow and grow until I run out of cotton. Once it's done, then I'll decide what it's for. This is due to a variety of reasons, lack of sleep, being busy, hands suffering from too much gardening, and the most frustrating-no internet! Since Sunday, there has been a problem, but hopefully, it has now been fully sorted. It's been very frustrating not being able to get online, or not to be able to do what I want when we can get a connection. My boys probably think it would be fun to keep me quiet, but that's sons for you. It's not been totally unproductive here, I did finish another pair of socks, not much to show for a week of activity. I did receive a lovely gift though. Some friends have just come back from Japan, and she brought me some lovely fabric. I'm not sure what pleased me most, the fabric, or the fact that she took the time to go and look especially for something I might like. 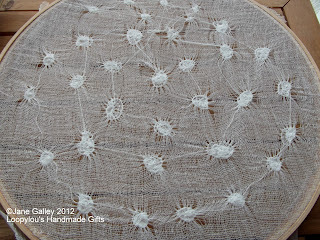 Hopefully, other tasks have been done, and I can get a few days at home with enough time to get stitching. I have two embroidery pieces started on the class that need my attention. 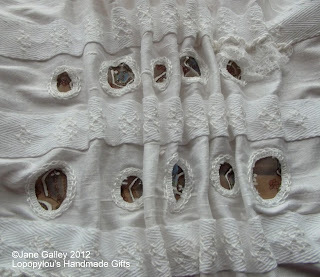 The embroidery on the "skirt" piece has been done. 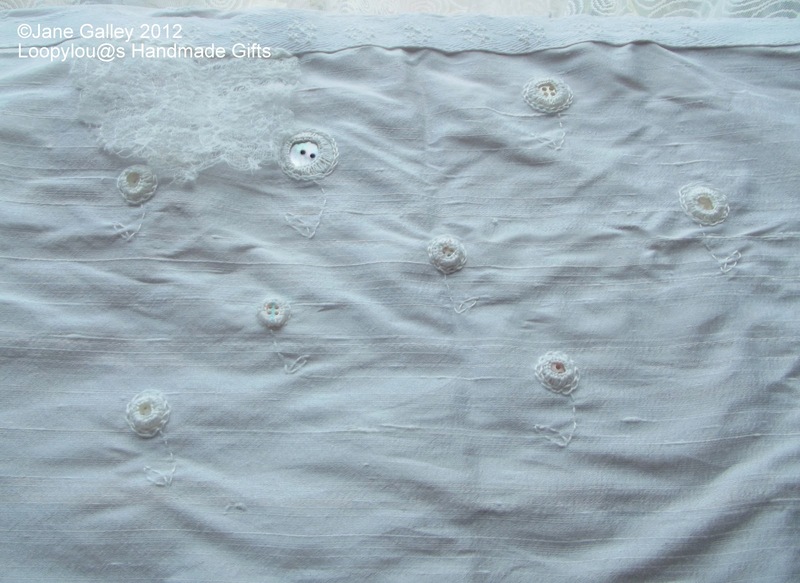 Buttons have been attached, using the same method as shisha mirrors, and then turned into flowers with a bit of running stitch detail. This is now being damp stretched before the next stage. 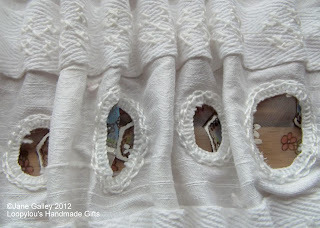 In the meantime, I did some machine embroidery on some scrim in preparation to make dangly bits. All will become clear in due time. This is waiting to be damp stretched, but I didn't have enough room on my board. 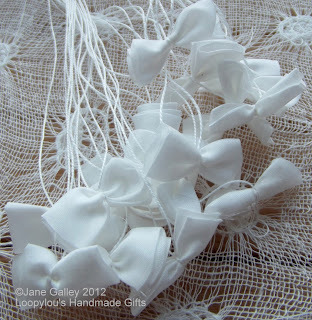 Pretty bows were next, these will be tied on for decoration, but where is for another day. 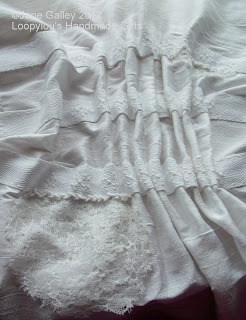 In preparation for a smocked piece, I've printed a vintage transfer to some silk and stitching has begun. Hopefully, more progress will be made today. Work has started on the next piece for the Extending Embellishment class. 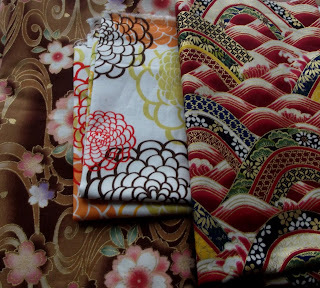 For this, I've taken a large piece of silk and have begun working from the top. 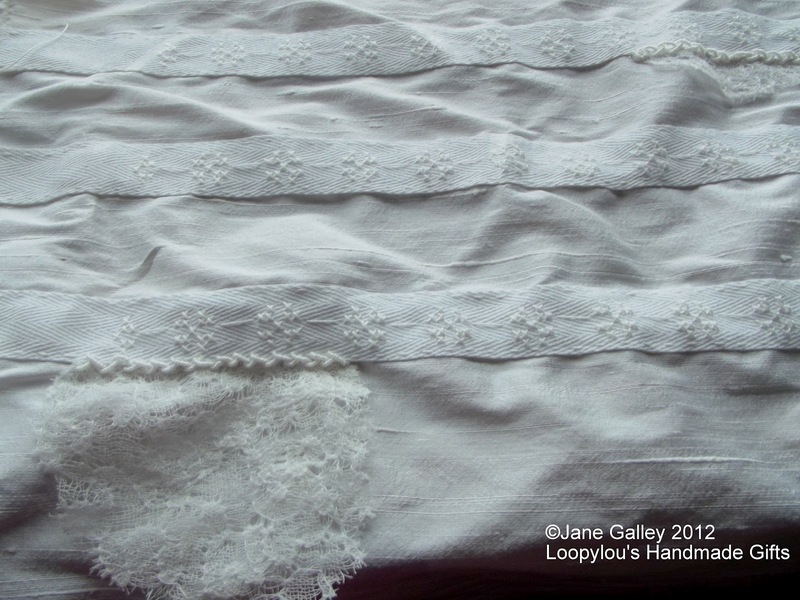 Cotton tape has been added and stitched on, with bits of scrim lace trapped underneath. The tape is for gathering the silk, but that won't happen until all the embellishment has been completed. 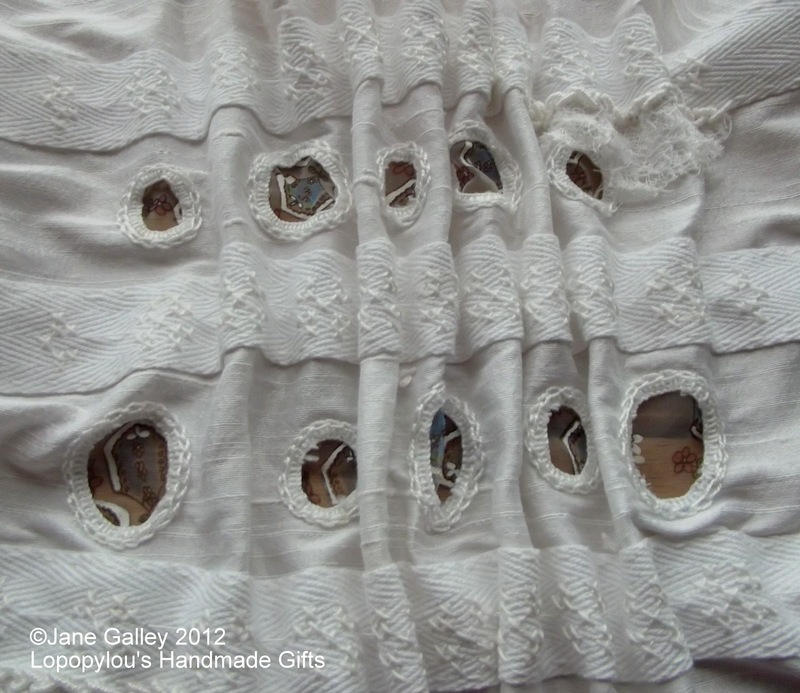 I then made some cutout circles between the tape, backed with a sheer silk printed handkerchief. Now there's more stitching to do at the top, and then on the bottom piece, but first, it needs a good damp stretching to see how it all looks. Hopefully, I can work on it some more this afternoon. 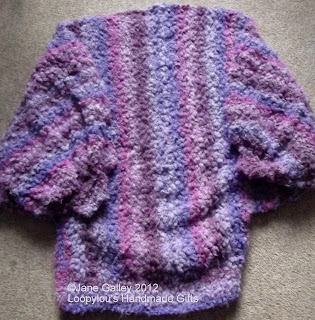 I remember in the '80's, the batwing jumpers, so I was a bit surprised when I bought a bag of yarn, to find a pattern for a batwing jumper was included. 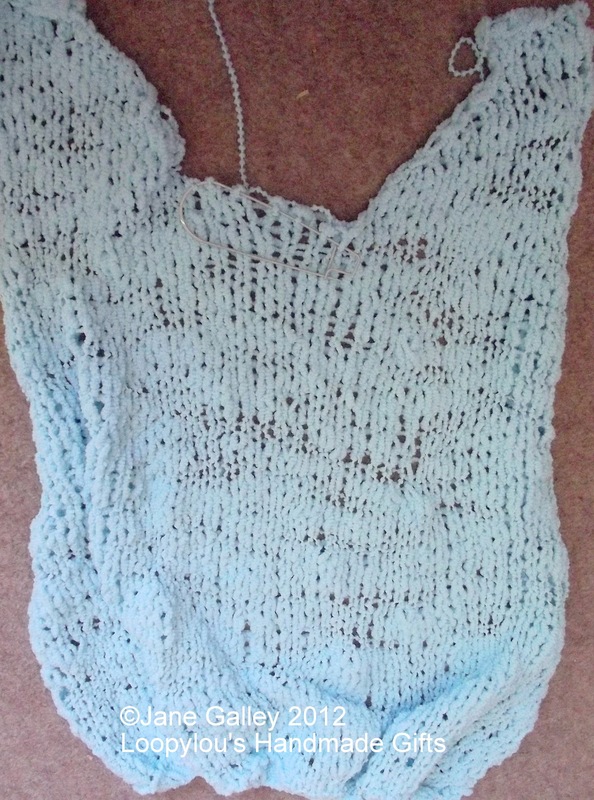 However, this one was knit in a completely different way to which I'm used. 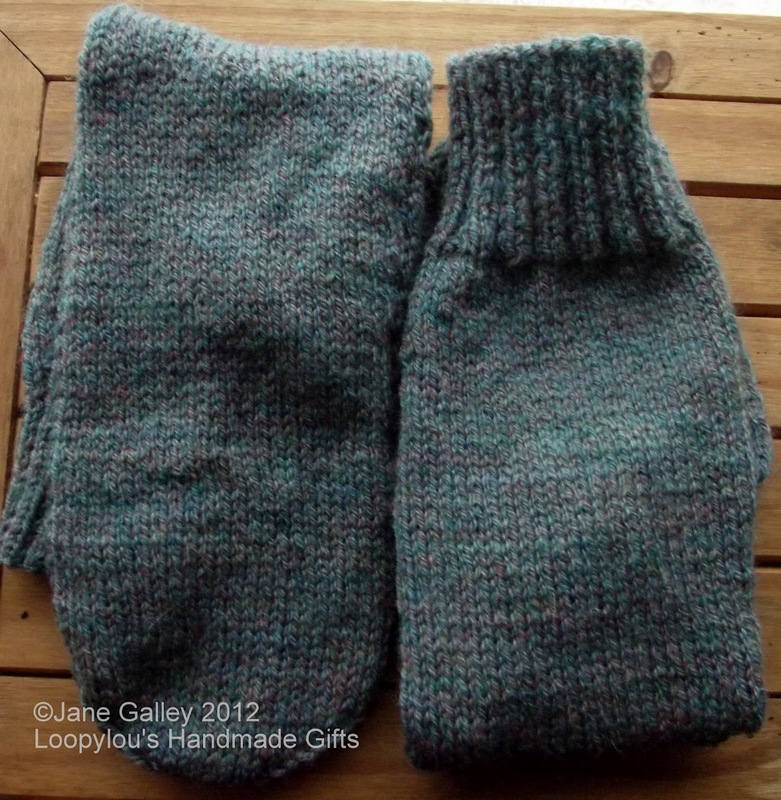 The body parts were knit from side to side, the arms were then knit from the main body. The good thing about that is, there are only two seams to sew up at the end. This jumper is knit using Wendy Wisp yarn, which can be quite a pain. The bobbles in the yarn meant having to buy a seperate yarn for sewing up, and it was quite difficult trying to find something that would blend with the colour. I got there eventually, and now, my knitting bag is bare, but not for much longer. 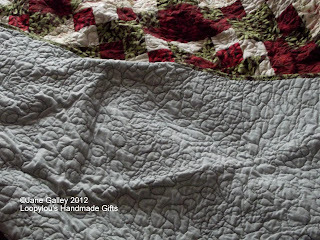 I quite like the lack of borders on the side, and I enjoy the hand quilting on these small quilts. I'm just hoping my finger tip hardens up quickly, it gets a little sore. 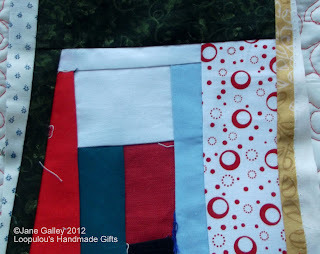 I had a little pile of fabric that needed cutting into 6" squares for a fabric swap. I thought if I got it cut and packed, that was a good job done, and the fabric is out of harms way. Once that was done, I started cutting the April Quilt on the Yahoo Small Quilt Talk group. It didn't take long to piece together, and by tea time, it's layered, pinned and marked ready for hand quilting. 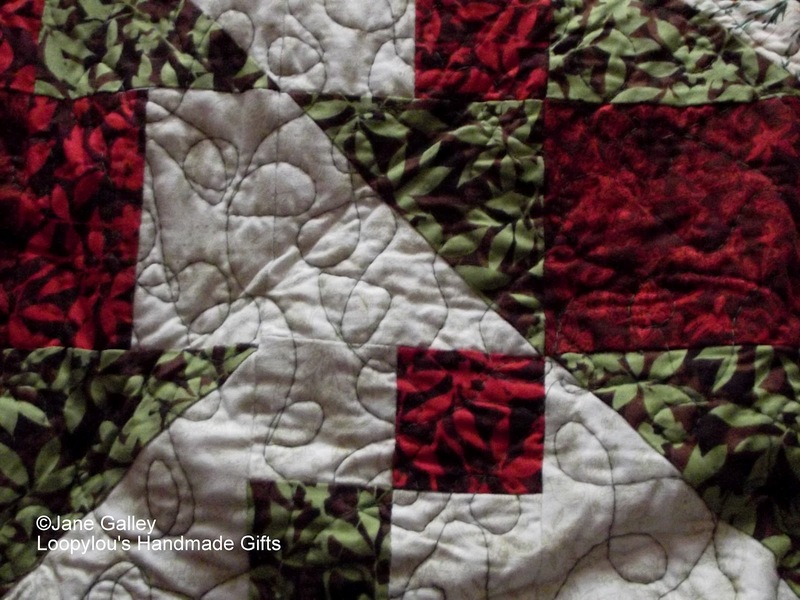 This is the first time I've done a quilt with no borders at the side. 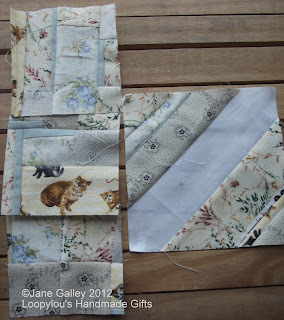 It makes a nice change, I shall look forward to seeing it with the binding on to finish. While I'm waiting for more supplies to carry on with the embroidery, it's nice to be able to do something that doesn't require a lot of relaxation, especially when the brain isn't working too well. 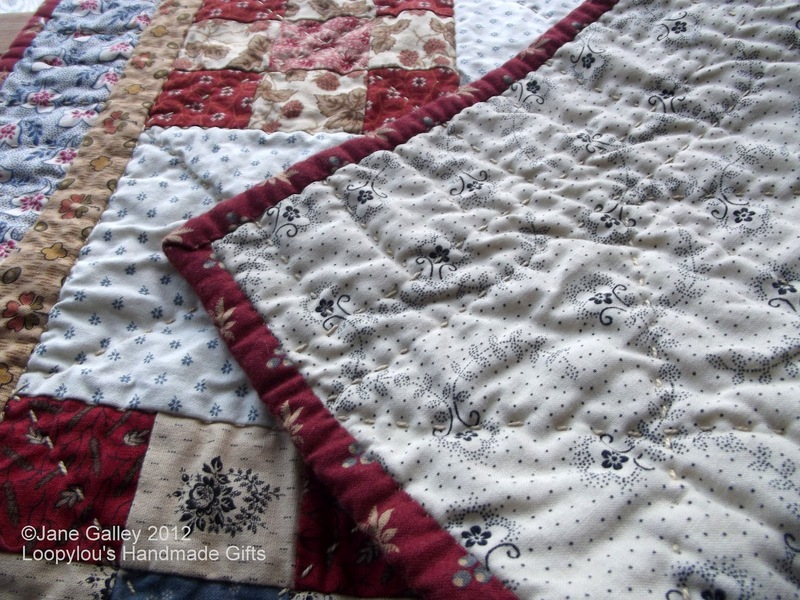 The crochet blocks are perfect for this, and it means the folders are cleared away for another month. Now to finish something else, and clear another space in my little corner. Out of the leftovers from the big blocks for this month, I managed to get a string block and three crumb blocks. I now have one piece of neutral fabric left. I shall get my thinking cap on to see if I can use it to make something useful, other wise, it will wait until next year to see if it will get any company. According to my youngest son, you can never have enough green houses, but I don't think he meant these sort of green houses. 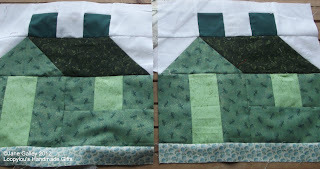 These blocks are getting easier and quicker to finish after four months of practise. Next month we will be adding blue houses to our collections. I can't wait to see how they turn out. In between the quilting and other sewing, I haven't forgotten about my Extending Embellishment class and am slowly working my way through the assignments. This piece was to do cutouts and needleweaving. Behind the cutouts, I've used vintage embroidery, FME silk paper, and scrim. Needleweaving has been used to connect cutouts, and to form a "basket" over a cutout. 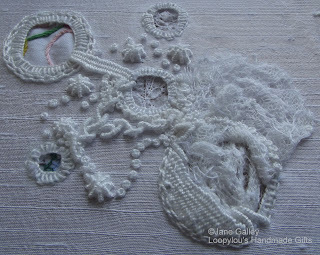 Web stitches, bullion and french knots have then been used to fill the space. 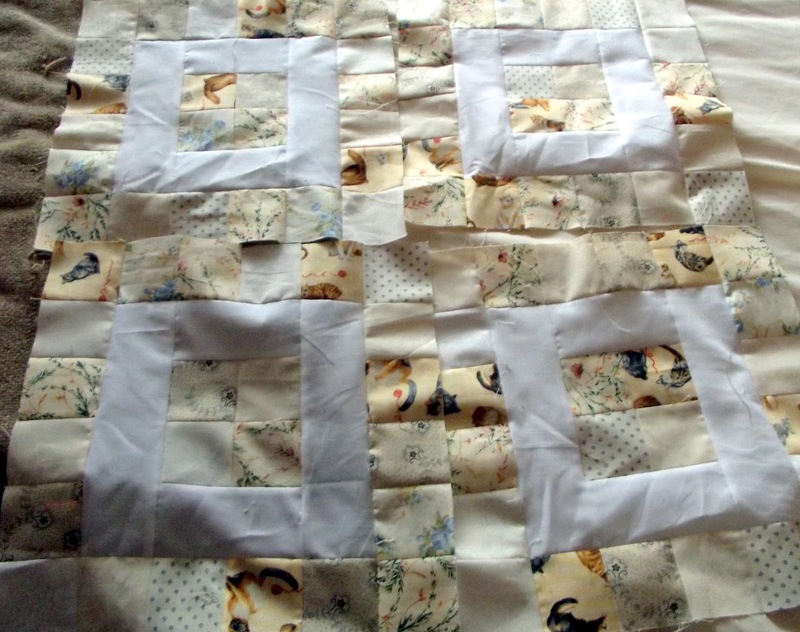 Chain stitch has also ben used around a couple of the circles. 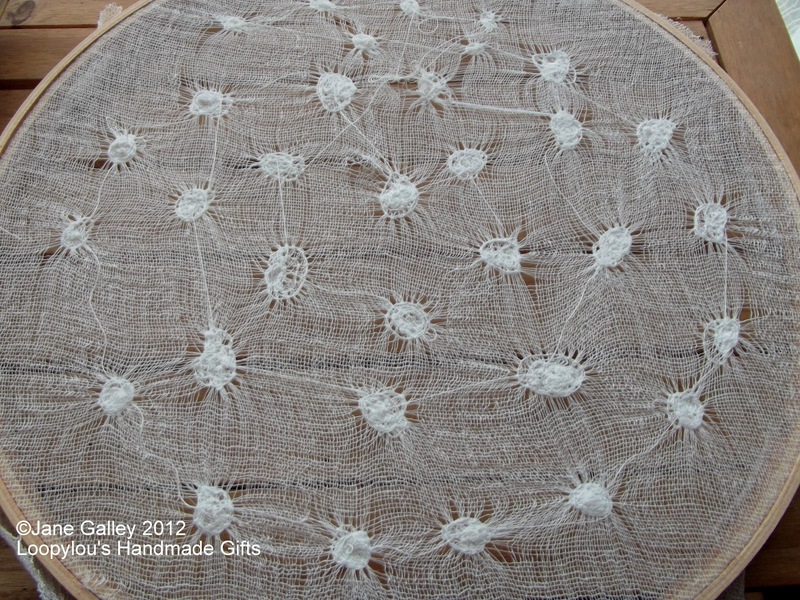 My next piece has been prepared, but I'm waiting for a delivery of thread to be able to continue. 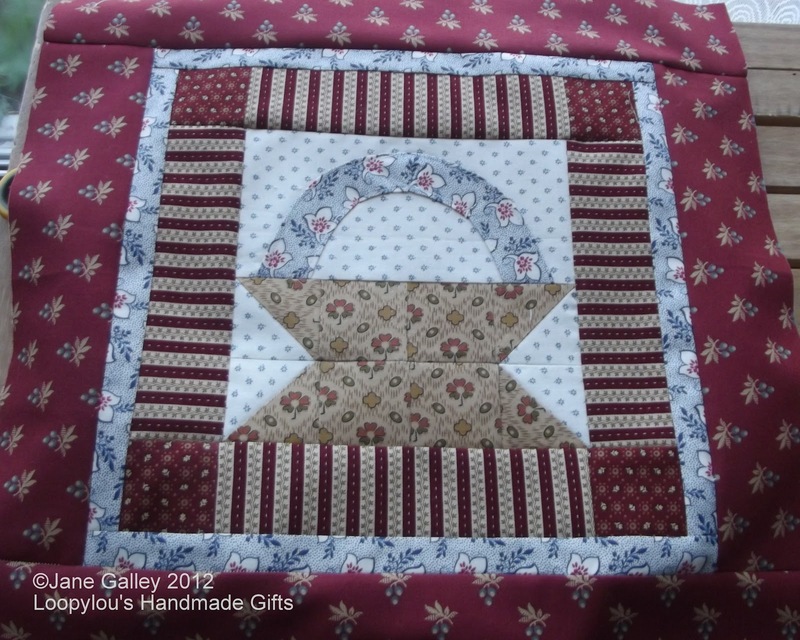 This month's colour for the Rainbow Scrap Challenge is neutrals and tans. I have even less of these than I had pink. This means, instead of six of the main blocks, I only have four. Never mind, they will be a welcome addition to the collection and I shall look forward to the colour selection for next month. In the meantime, I think I shall have enough for a string block and some crumb blocks. 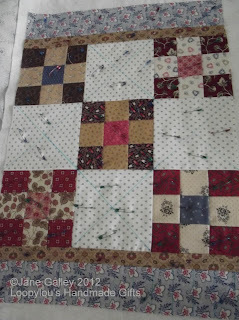 The thread arrived, some perle cotton, and I was able to spend the evening hand quilting my basket block. 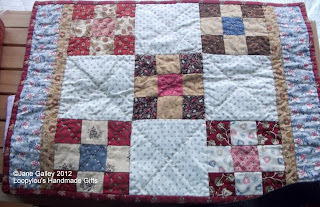 I was quite pleased with how it turned out and made a nice change from machine quilting. The binding was hand finished too, all in all, a relaxing project to do. The pattern for this month has been released, and I'm hoping it will be finished before the end of the month this time. 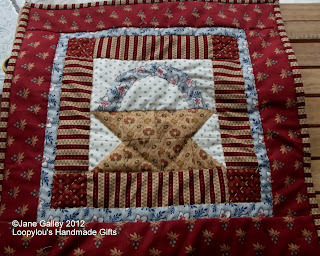 After the practising FMQ on small pieces, I thought it was about time to try it on a bigger quilt. 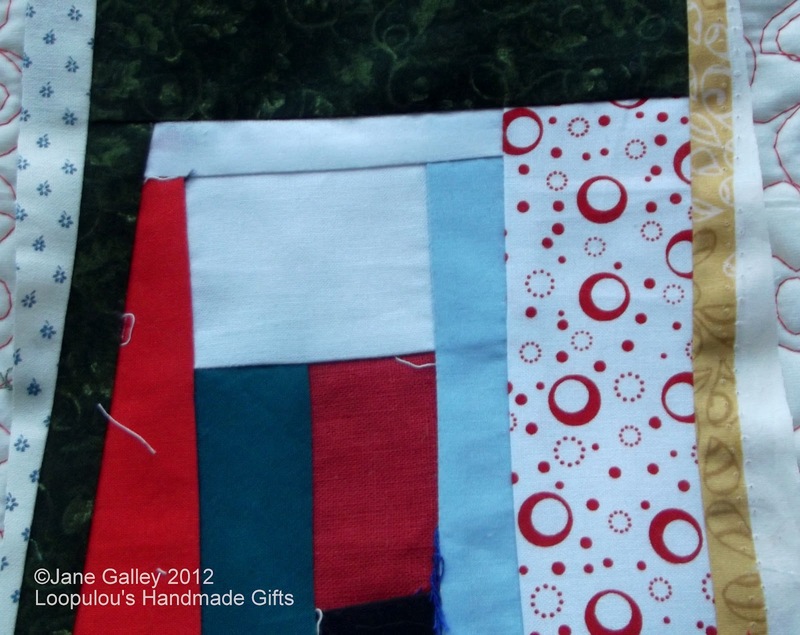 I think it might have been a good idea to try a lap quilt, rather than a full sized quilt, it was hard work! 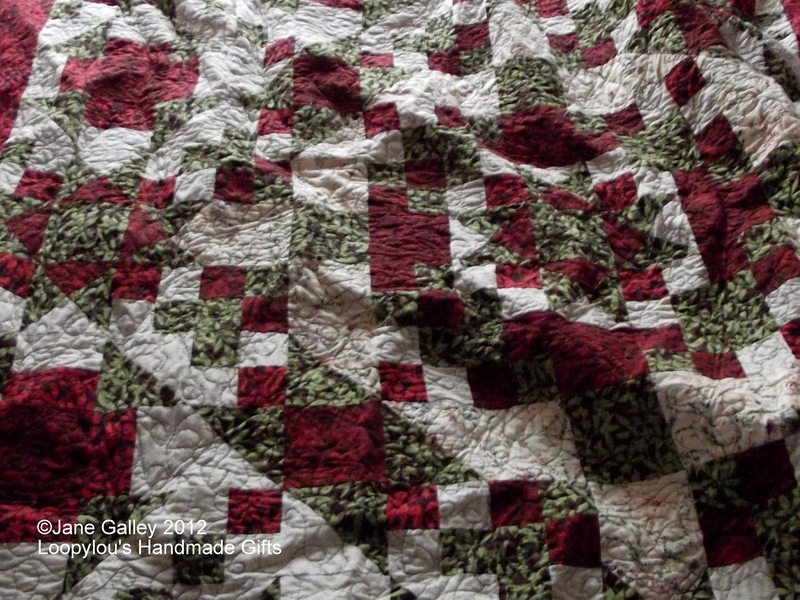 This quilt was one of the Mystery Monday quilts I did, and I managed to find a cotton sheet from a charity shop for the backing. It took hours sat at the machine and was heavy going at times, but eventually it was done. I didn't do anything fancy, just loops and waves. I didn't want anything too precise for the first attempt. When I'd finished, I was a bit disappointed with the effect, but glad I'd tried. I was sure the next one I did would be straight lines! Then I put it in the machine, washed it and dried it, and it looked completely different. 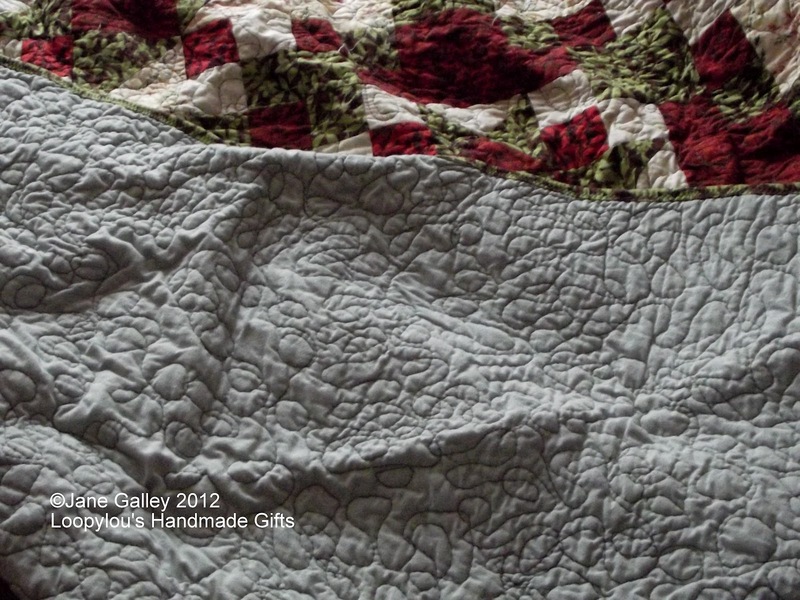 It had that love scrunched up look that makes quilts look so cuddly. Maybe the strain had been worth it after all! I have another quilt to sandwich, and then it will be time to decide, straight lines or FMQ. 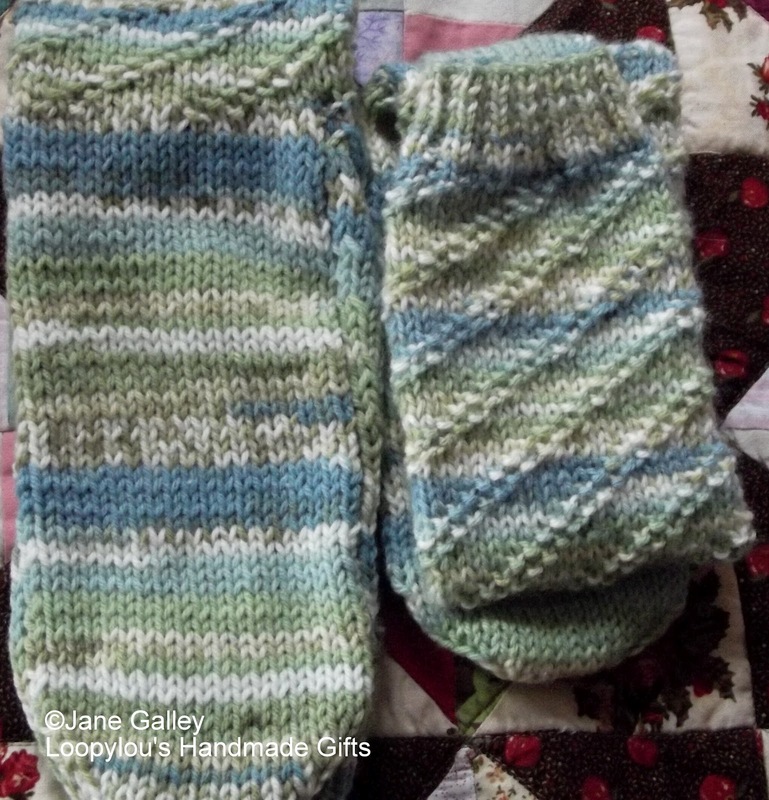 A friend was visiting and admired the boys hand knitted socks, and was say how she would love to to have hand knitted socks. I did have some ladies socks I'd made, but they were too big for her. She is tiny, so I found a couple of balls of this yarn and knitted a smaller pair. I haven't done this pattern before. They have a longer leg with a diagonal moss stitch pattern. All we need to do now is wait and see if I've done the right size. Another March challenge that almost got away, but it is near a finish. On the Yahoo Small Quilt group, Kathleen Tracey, is setting a challenge every month. 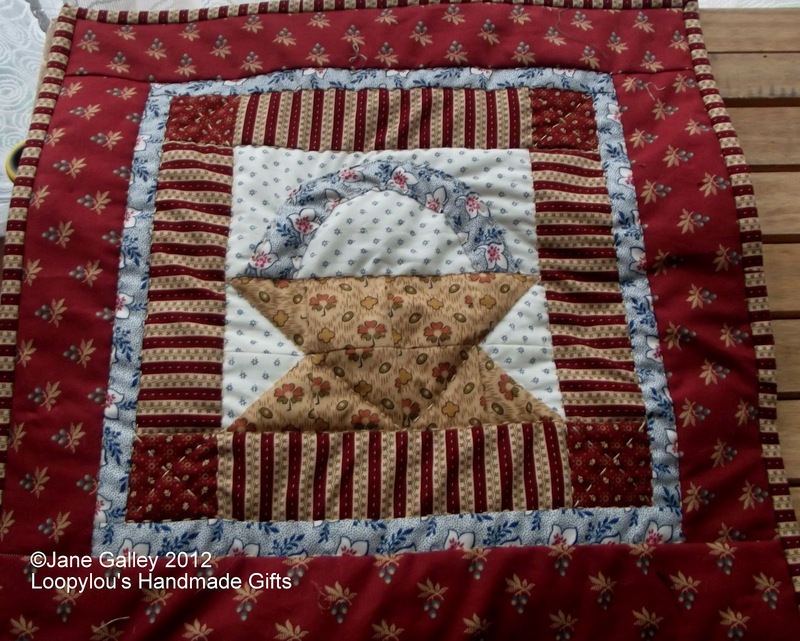 Most of the quilts are coming from her books, but as I don't have them, I am adapting my blocks and quilts from the photos. I knew I wouldn't have time to make a big quilt, so I've made a one basket block to make a wall hanging or table topper. 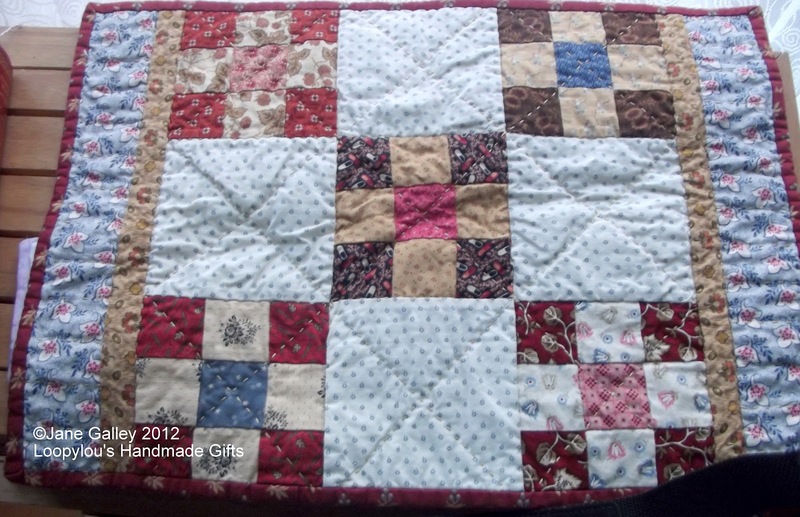 I've got it all pieced and am just waiting for some thread to hand quilt it. All being well, it won't take until the end of April to get finished. I even managed to get another crumb block made. The way this month has gone, any progress, no matter how small, is very welcome. Hopefully, April will be a bit better.